White mini pumpkins are very popular again this year! I had several people comment recently about the Baby Boo’s I used to decorate StoneGable with this fall.Apparently, mini white pumpkins are not available everywhere… but no problem. We can fix that! Today is THROWBACK FRIDAY. I decorated and posted my fall mantel on Wednesday and got so many comments and email asking if the white pumpkins on the mantel were real. No, they are not! It’s still too early in my area for white pumpkins. No problem as I said in the intro. I paint faux orange pumpkins white. Easy peasy! You can do it too and always have amazing white pumpkins to decorate with for years! This is such an easy diy and YOU CAN DO IT TOO! The pumpkins started out like this…. White pumpkins have lots of soft yellow undertones. I wanted to capture them as realistically as I could. 1. Choose orange mini pumpkins. Use only a tiny bit of paint, about one or two drops to 1 tsp of wax. Mix together and that is a sludge. 4. Wax the pumpkin. If you need a little more color add another drop of Country Grey to the sludge and rewax the pumpkin. Let the wax dry and buff with a soft white cotton rag. 5. Pull out the plastic stem of each pumpkin. 6. AND HERE’S THE SECRET TO MAKING OUR LITTLE WHITE PUMPKINS LOOK REAL! Glue a real pumpkin or gourd stem in its place. I pop off the stems of real pumpkins and gourds every year and save them. To pop off a pumpkin stems, put pressure against the side of the stem at its base with your thumb and it should pop off! Towards the end of the season, I visit my local greenhouses and ask if I can have pumpkin stems from their discarded pumpkins. I tied a black and white checkered ribbon around the stem of these little white pumpkins … aren’t they so sassy? I have a few fun fall projects using white painted pumpkins coming soon! You might want to pin this to you fall or diy Pinterest board. 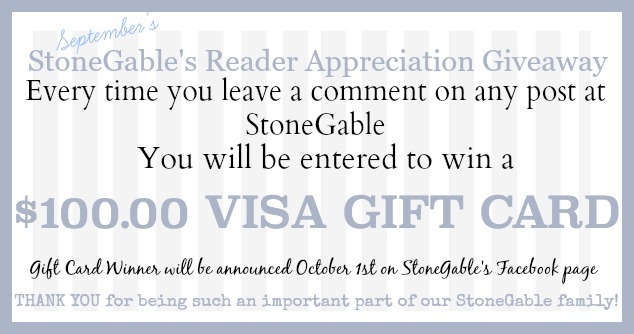 Or follow StoneGable’s Pinterest boards by clicking HERE. These are so stinkin cute. I’m painting these as part of my tablescapes for my sons October wedding. I bought the Annie Sloan’s paints today. First time using chalk paint so Im crossing my fingers. I did have a question regarding the sludge. It looks pretty thick and I’m wondering how you applied it to the pumpkins? Thanks. This is exactly what I’ve been liking for! Now I just have to find a green house in my area! Love the natural colors you use. Doing blue and tan this year for fall. Can’t wait to see what’s next! I sooo love this! I have never really liked fall colors other than on the trees and a little orange outside at Halloween, so thiw iw the best! I usually don’t find enough white pumpkins until closer to Thanksgiving, so this will really help. Also, I have saved stems the last few years just because I loved the colors and textures and now I know how to use them! I had kind of collected them in a jar like some people do corks! So many pretty things to look at on your blogs/sites-Yay! I have an on-going love affair with white pumpkins-my second love is black & white gingham…you do it better than I have ever seen ! Love it all – thanks! Love you blog. I look forward to it everyday. Love these pumpkins! I need stems! ? Love the pumpkins! I have been gathering the supplies, can’t wait to try this! ADORABLE!!! I wondered why the stems looked so real. Who would have thought to get real ones — except you. This is something I will remember. I love the checked bows, too. Thanks for sharing. 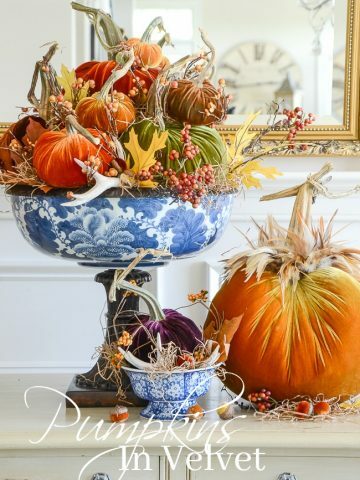 The painted pumpkins are so sweet and the pale blue is gorgeous! Now, along with the stem trick, I have a new passion. 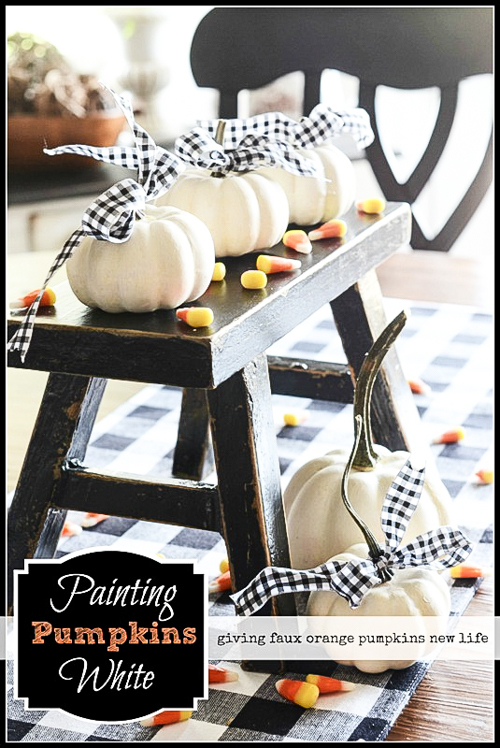 Love your articles and especially this one about painting the pumpkins!! Can’t wait to try it on mine!! Also, the stem idea is wonderful!!! Look forward to your page everyday!!! Keep it up and thanks so much!!! I wondered how you got them to look realistic…….thanks for sharing your tips on “sludge” and the stem idea is genius! White pumpkins work so well with a beach theme room. Who knew pumpkins and shells would make great partners. Oh, my! They do look quite real because of the actual stems you use … I hope I can find some Pumpkin Patch or Garden Center in my area this year to save stems for me, too! I have changed quite a few faux pumpkins recently, and instead of actual stems, I “scoured” roadside parks along the highways (on a recent trip or two!) for fallen dried or dead twigs. If the end is not flat/blunt cut and has a twisted sort of look, they actually seem pretty real! A little dry brushing of different brown paints adds even more realism! Note of warning: at some stops we encountered “Watch for Snakes” signs, so I recommend great caution wherever you are gathering nature’s bounty of any kind. Keep an eye out for any stray “critters!” Safety First! Thanks for all you share, Yvonne …!!! KATHLEEN, What a great tip! Thanks so much! Love, love, love these! Thanks for the instructions! I have everything I need to get started! Brilliant, Yvonne! Just finished six of these babies while watching football! Good for you, Julie! That’s what I do too. Work while watching tv. Did your team win. LOVE football season! I might try this. I love mixing the white with the orange ones. I am so in love with these little whit pumpkins, printed of the how to. I love the white pumpkins, thanks for sharing. Great tutorial. 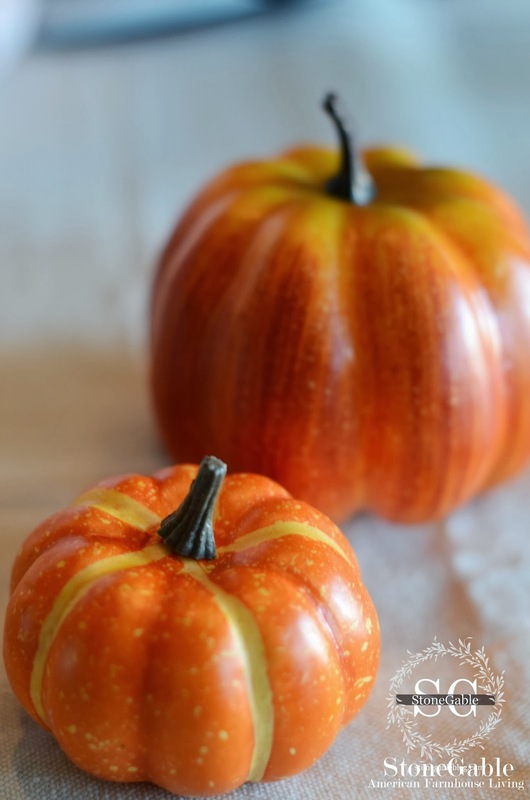 I love the idea of painting pumpkins and adding a real stem is brilliant! What a great idea, thanks for sharing. Can’t wait to get started! Thanks for the paint receipe! Can’t wait to get started! 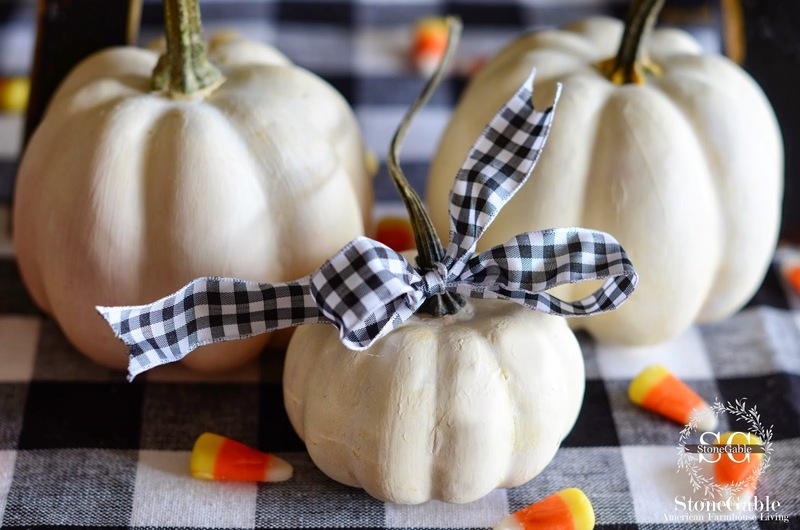 Love your adorable little white pumpkins ,thanks for the instructions on how to transform those store bought little pumpkins into something really amazing. 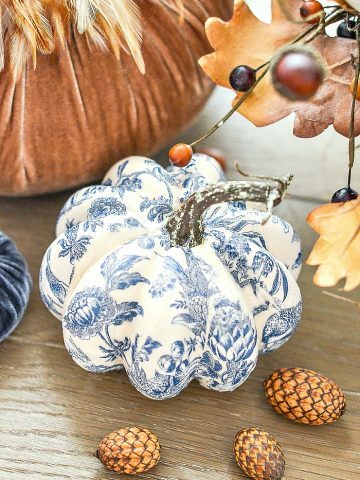 I can not wait to make a few for my fall decor. Cuties! Maybe more than I want to take on right now, but adorable! I was so excited to find velvet pumpkins at Marshalls today for $4.99/$7.99. I would have been more excited to find more in the neutral tones, but I have plans to search area Marshalls this weekend! Oh–and I love the little black stools!! Beautiful little pumpkins!! So sweet. Thanks for the reminder concerning the give a way. Pick me! Pick me! ?? I’m grateful for this Labor Day weekend so I can try this. It looks so easy, with SUCH cute results! Love Love Love! Yvonne, you are a gem. Hi Yvonne, Love your creative way with the pumpkins and ribbon. But, I love the little black stool that I have spotted in so many places in your home. Was is it’s history. Great idea! I love the ribbon too. love these white pumpkins. Cutest things. Great idea! I will definitely have to give this a try! The Annie Sloan was is hard to work with! There are others I’ve seen but can’t remember the names but are almost liquid to apply. Great ideas tho!!! Love this idea. Look forward to trying this next week. Thanks for the great tutorial they look so good! I’m not familiar with the sludging of the wax and paint. I assume you are taking about the wax I use on top of my chalk paint. Oh my! What a great idea painting them white. They are more expensive this yr than in the past and I have tons of orange ones. I like the color combinations of the black, whites and oranges. Great job. 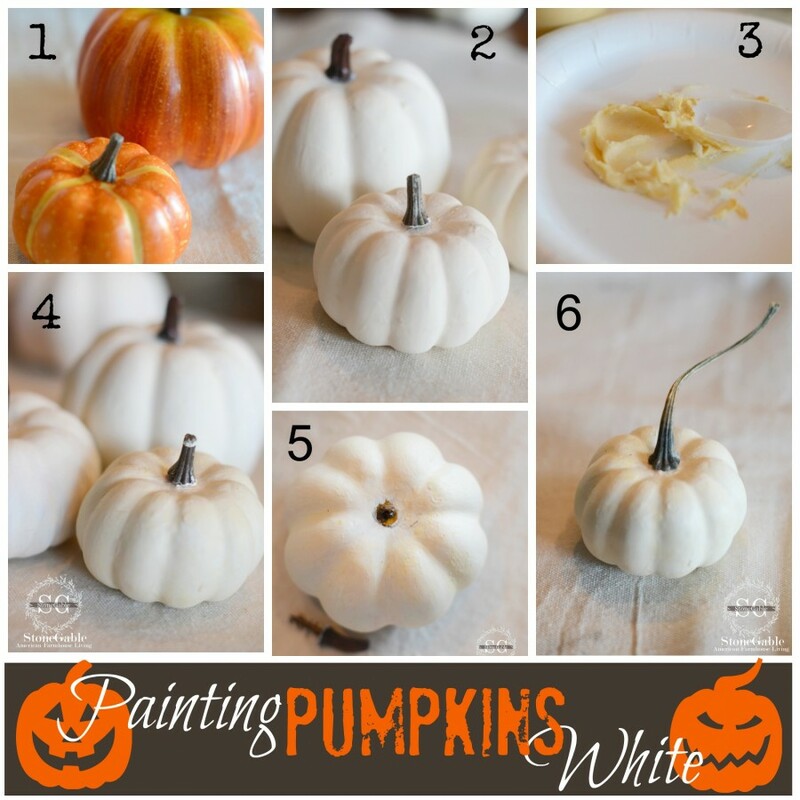 thank you for the tutorial on how to paint the sweet white pumpkins! I love baby pumpkins! Thanks for the idea of how to paint them. They will look cute in my dough bowl on the table! The white pumpkins are beautiful. I will be trying this. Darling little pumpkins! Love your mantle! Love these white pumpkins – your tip about the stem is the best!! Great idea (as always), you are the best!! Adorable and thanks for the instructions! Can’t wait to try the sludge technique. Last year I decopauged torn book pages on my little white pumpkins. I think your technique would be the finishing touch they lacked. Thank you! thank you for the fabulous tip of the “sludge wax” finish. I,m excited to start painting pumpkins! Sometimes I can find pretty interesting stems while pruning my grape vines. I love the color orange. In fact, I decorate with it. I too love orange pumpkins, but I do so love the white ones more for interior décor. I will definitely try this one. Thanks for the tools to learn how to do it. 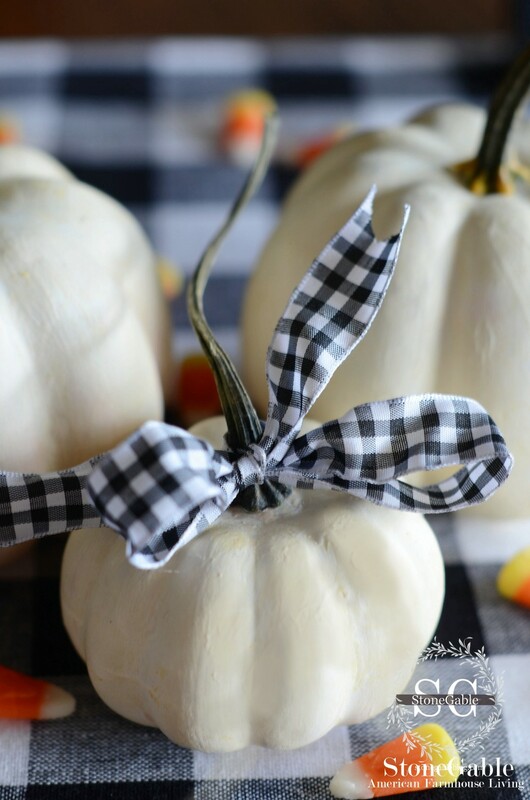 The white pumpkins with the gingham ribbon is adorable! I love the idea of using a real pumpkin stem. I have some large pumpkins I plan to transform. a big Thank you once again for these delightful little pumpkins … I plan on painting some up this week-end … Happy Fall !!! Can’t wait to try the white pumpkin painting. Love the Baby Boos. Now I just need to find a bag of them to paint. Thank you, Yvonne, for a great tutorial. You can find clear wax at any hardware store or my favorite is Amy Howard’s Light Antiquing Wax at any Ace Hardware. Clever you and all your readers who save pumpkin stems – would never have thought of it. Adds the perfect finishing detail. Thank you for another great idea! So cute…love the ribbon and the way you have them sitting on the black bench with the candy corn!! Yvonne, you are brilliant! Thank you for sharing your knowledge. So cute and such talent, I will be painting mine. Thank you for all you teach us. ?? Love em!!! Do you ever sleep?!!! You are my go to for inspiration, Yvonne. I find being creative takes it’s toll on my brain sometimes, hard to shut off at nite. These are super cute! I love white pumpkins. I have never been a big fan of orange in my home decor, but what is Autumn without pumpkins? The checked ribbon and real stems just “make” them! This fall when we go to the pumpkin patch, I’ll look for the ones with large stems. I love the gingham ribbon. This summer I bought 2 pink dogwood twig wreaths and hung them with long black/white ribbons and a bow. I’ve received so many compliments. Can’t wait to see your projects using white pumpkins. First thing in the morning I read your blog faithfully. We have a boutique that uses these gingham ribbons throughtout the store. That is their stamp. will it work to use craft paint because that is the only paint I have and I do not have any wax also. I love the stool. These white mini pumpkins are so cute! I purchased the last two that were available at our dollar store, so now I’ll make some more, thanks to your tutorial. Thank you for the instructions on how to do this. I know what I will be doing this week! Love your blog! Oh my goodness… talk about timing! One of my projects for the weekend! I hope my little pumpkins look as cute as yours! I was wondering about the stems & they sure make the pumpkins look real. I love the bow tied to the stems! Thanks for the tip about pumpkin stems!! I just bought 7 beautiful medium sized pumpkins (orange) at the Dollar Tree, but the stems are really fake looking. I plan to paint them white and now I know what to do for the stems. I am going to use them on my inside staircase that is open part way. You always come up with solution for any decorating problem that I have. Thanks again and keep posting those great tips. I love the tip of switching out the faux stem for a real one! It really makes the pumpkin look authentic. Love, love, love! Love that they look so real. Love that it’s easy to do. And love that it saves me money year after year. Saving real pumpkin stems for glueing on faux pumpkins is brilliant! I have a few faux pumpkins that I have painted but the stem is the real giveaway. Hopefully I would have thought of it at some point, but thanks for the idea. So great. Love this look. . yet it won’t break the bank!! Love the fact that you added real stems!! AWESOME!! I found a “chalking ” medium to turn any water soluble acrylic paint into the matte finish we are so fond of at a fraction of the price. I have a lot of little bottles of craft paint and can mix to get the exact shade I want. Got it at Hobby Lobby with my 40% off coupon. More inspiration from you. LOVE white pumpkins but not always the price.We grow pumpkins so I have stems. Never even thought about saving them. You are a wonder!!!! This is right up my alley. First off, I love anything black and white. Then to incorporate it into the Fall season and pumpkins! Wonderful. I have that ribbon so this is a definite project that is going on my list. Great idea! Thanks Yvonne! I love the idea of using real stems! You are so sassy….just like your little pumpkins!!!! Your inspiration never ceases to amaze me! I plan on using my real baby boos along with some I’ve painted in my fall decor this year. All thanks to reading your blog for several years! I hate to tell you how many ideas I have stolen from you!! These are adorable, I love the black and white checked ribbon too! I wish I would have thought of saving the stems from last years pumpkins and gourds! I have asked my grocer for the stems in the bottom of the pumpkin box in the past! Broken-off twigs from the garden work nicely also – if you find the right shape and a realistic diameter. Sometimes, I also paint the (plastic) stems with brown and/or a touch of green acrylic craft paint and find I don’t necessarily have to remove the plastic stems IF they look authentic. 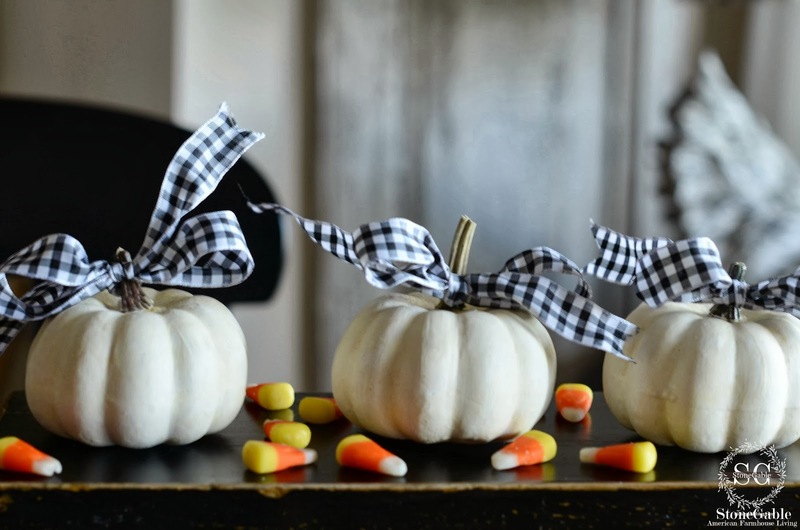 I never would have thought to save pumpkin stems – such a great idea!! I actually love orange pumpkins and how they look with all of my decor, but I think it would be fun to add some white ones, too. I’ve pinned your tutorial. I’m dragging my orange ones out today! Love this idea. Thanks for sharing the details. I love theses white Pumpkins ! So cute ! 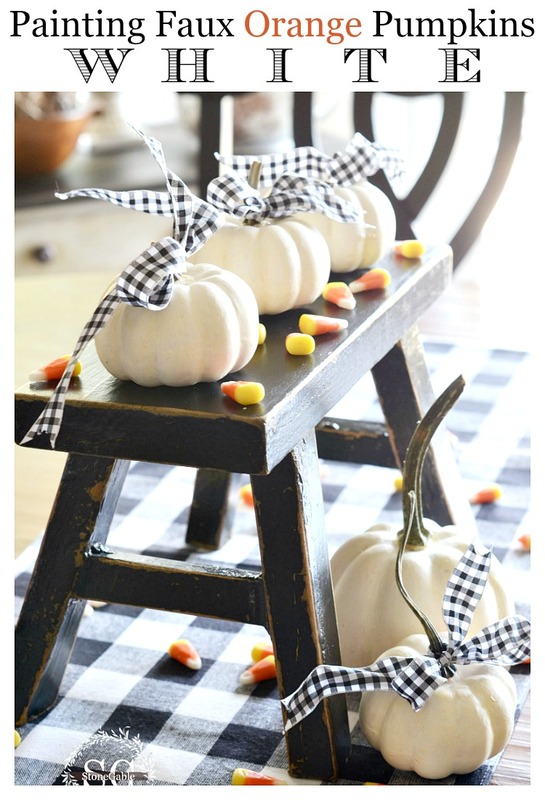 Love the little pumpkins too and the white with the checker black and white ribbon is just different. I like it. Nothing saw fall like a pumpkin! I love saving pumpkin stems. I even started saving zucchini stems. i was one of the askers, so thanks!! and for extra bonus points, you threw in the waxing tip! you are so kind, Ms. Genius! 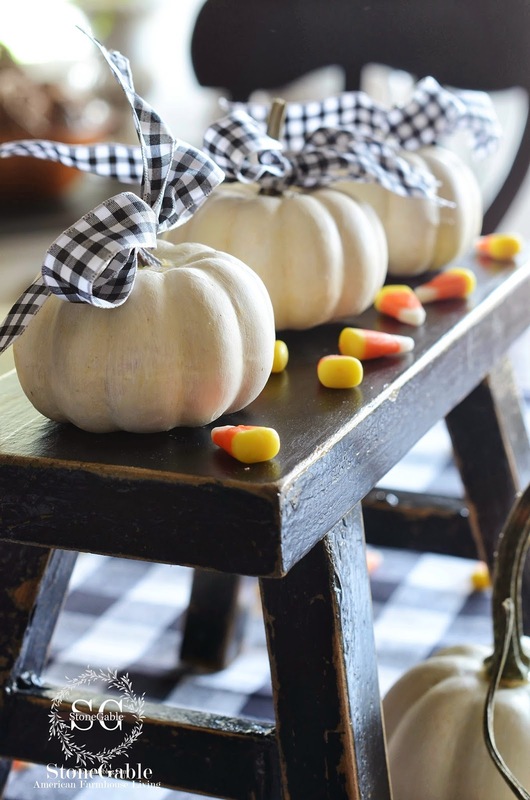 Love the idea of using real pumpkin stems. Makes such a difference. Thanks. Michael’s have faux white pumpkins with a 40% off coupon. However, think that painting se real of them would be fun! Thanks for the tutorial, Evonne, and the tip about the stems! Have a great Labor Day weekend! They look so real! I love white pumpkins. I saved my stems from last year’s pumpkins. One step in the right direction. Thank you for sharing. YOU GO GIRL!!!! Good for you Wendy! I save pumpkin stems every year also. I use them for my fabric pumpkins and now I will use them on painted ones also. I can’t wait to get to my pumpkin farm and get some real ones which are coming out soon. Sassy is right! That idea about realistic stems is brilliant! Will do. Obsessed with the gingham/buffalo check details!!! Well done! Oh, thank you, thank you. What a perfectly timed post. I have been wondering how to paint all my orange pumpkins as the chalk paint alone just didn’t look right and I was afraid it would peel. The “sludge” of wax is the perfect answer. Yvonne, you are a treasure. Using chalk based paint and a sludge makes a huge difference! They all look so real. Great idea about getting stems. Awesome, white pumpkins aren’t available here in Missouri yet either, thanks for the help, yours DO look so REAL! Great idea. I use white pumpkins every year, but frankly, some are not really white- kind of a blah beige. Thanks for the tip to save the pumpkin stems! I have a friend with a fence full of vining gourds! guess whee I am going today! Love white pumpkins, and those with a bluish grey cast. Since I do NOT like orange in decorating that is a good thing! Good idea and looks easy…..
thank you for the directions. i love the ribbon too. just pinned it!!!! Will try this. Looked everywhere for faux white ones. No luck. Thanks for the how too! so darling! I will be trying this for sure this Fall! Thank you for the instructions & special tip about the stems! Great tip about the real stem trick! Love it’s!